Last year I did two trips to the Southwest and found the landscape to be both breathtaking and jaw-dropping. Theres just so much amazing scenery out in Utah and Arizona and I knew I had to go back. Andy and I found a cheap flight into Grand Junction, CO and made a quick 1.5 hour drive over to Moab. The first two days we visited all around Moab, Arches and Cayonlands National Parks. We witnessed sunset at Delicate Arch, light painted with the tail of the Milky Way at Double Arch, saw a beautiful sunrise at Mesa Arch and amazing grand views at Green River Viewpoint, did a short hike to Bow Tie Arch and Corona Arch (and saw people bungie jumping off Corona), and lastly hunted down False Kiva for sunset. By the time we got back to the hotel on Saturday night we had decided we had seen enough and wanted to head to Monument Valley, which isnt close to anything convenient, but was only 2 hours from where we were. 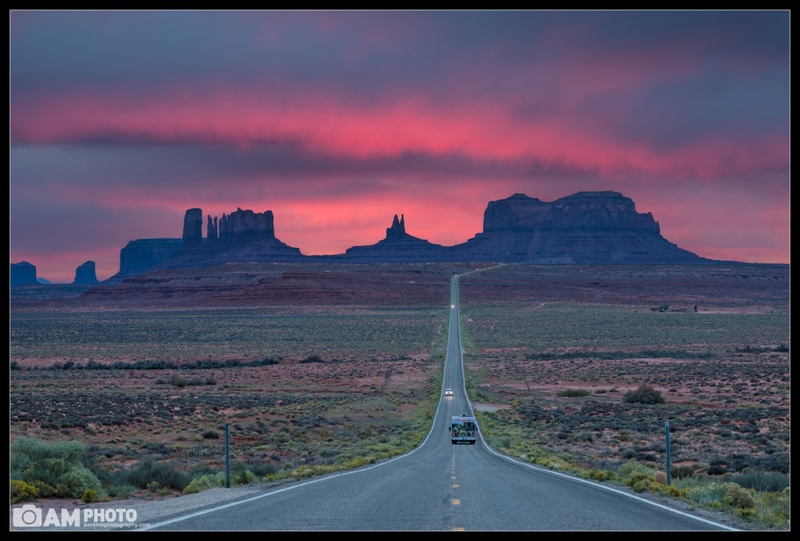 It took us a couple hours to make our way south towards the Arizona border but we eventually made our way into the Navajo Nation and the familiar scenes of Monument Valley came into view. I say familiar because I can remember seeing these mesas, buttes, and spires from the age of 6 when I first played the computer game Oregon Trail on an old Apple IIGS. After stopping at the iconic Mile 13 we drove into Monument Valley, paid the 5/person entry fee, and then drove through the 17 mile dirt road in our little (crappy) rental car. After having a weekend of boring skies, cloud had finally rolled in and we debated where we wanted to photograph the sunset I havent had much luck shooting east for sunset and we decided to head back to Mile 13 since the view faced southwest. It was actually a lot of fun having to run into the road, setup the tripod real quick, snap a few shots, and then run out of the way as cars drove by from both in front and behind us. Looking down at my watch I noticed that the sun had set and we only had a touch of color in the sky above Stagecoach, Saddleback, and King on his Throne mesas. To our right, further west, I could see beautiful pinks. As we waited the color started moving closer and closer to the mesas. I started screaming KEEP COMING, KEEP COMING. JUST A LITTLE FURTHER Sure enough 5 minutes later the sky lit up with amazing pinks, even providing a nice frame above the mesas. The color was so bright, in fact, that I had to tone down the saturation a bit to make this actually look believable I also debated removing the cars from the road but ultimately felt it gave the scene more place and helped draw the eye in.